Heart Healthy Superfoods For Baby Boomer Superwomen! Healthy Starts Made Simple: Nutrition for Baby Boomer Superwomen! Heart-healthy benefit: Helps support healthy cholesterol profiles. How they work: While the mechanism is not clearly defined, various studies have shown that eating a certain amount of almonds each day can help alter blood lipid profiles by reducing LDL cholesterol to varying degrees. Put them to use: Choose raw, unsalted almonds whenever possible. Add them to salads and yogurt as a topping; toast sliced almonds and serve atop baked fish. Heart-healthy benefit: Helps support healthy blood pressure. How it works: Cocoa contains compounds called flavanols, which may improve blood vessel flexibility. We can get them from some chocolate with a few squares a day. Certain dark chocolates are likely to have more flavanols than the milk chocolate varieties, because it starts with a higher cocoa content than milk chocolate. Put it to use: If you like a little sugar with your coffee, try melting a small square of chocolate into your next cup in lieu of the granulated stuff. The key to gaining the health benefits of chocolate is not to overindulge, as many chocolate-containing foods (think cookies and cakes) are also high in fat and sugar, which may negate its heart-helping qualities. Heart-healthy benefit: May help support healthy blood vessels. 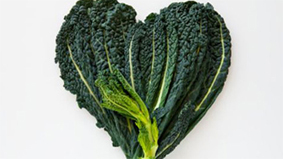 How it works: Kale boasts heart-healthy antioxidants, fiber, folate, potassium and vitamin E. It also contains lutein, one of those uber-healthy carotenoids, which have a number of functions in health and well-being, including cardiovascular health. Put it to use: Lightly sauté in olive oil with sliced onions and mushrooms; toss it with olive oil and roast until just crisp. Heart-healthy benefit: Support healthy cholesterol. How they work: The soluble fiber beta-glucan, which is found in oats helps to lower LDL cholesterol and overall cholesterol levels. Put them to use: Oats are typically thought of as a breakfast food, but tasty high-fiber cereals, like Kellogg’s FiberPlus Cinnamon Oat Crunch, are super-portable and can make a great afternoon snack or post-dinner treat that satisfies your sweet tooth. Heart-healthy benefit: May help boost HDL cholesterol. How it works: Any alcohol nudges up HDL, which helps support healthy arteries. But red wine may offer additional benefits: Compounds called polyphenols may help keep blood vessels flexible and reduce the risk of unwanted clotting. Increasing alcohol consumption for the purposes of cardio protection, however, is not justified. Put it to use: The heart-health benefits come from small portions — one 5-ounce glass is all you need. In fact, more than one glass of vino a day ups the risk of breast cancer for women, and chronic heavy drinking damages the heart. Although no formal recommendations for light alcohol consumption have been made, the American Heart Association recommends that alcohol use be an item of discussion between physician and patient. If you don’t already drink wine, health experts say this benefit is not a good reason to start, as there are other foods and behaviors (such as regular exercise) that will help protect your heart. Heart-healthy benefit: May help support healthy blood lipids. How they work: The omega-3 fatty acids in cold-water fish support heart health, and sardines have among the highest levels. These good fats have been associated with lower harmful triglycerides and increased protective HDL cholesterol. Put them to use: Try them diced into a salad or as a topping on snack crackers; chefs have also begun grilling sardines for sandwiches, and even pizza toppings. If the taste of sardines just isn’t for you, consider trying another fatty fish, like salmon.